Fifa 15 has a huge list of teams from various countries and leagues. The game also offers two locked teams, which can be achieved exclusively by catalog of items. 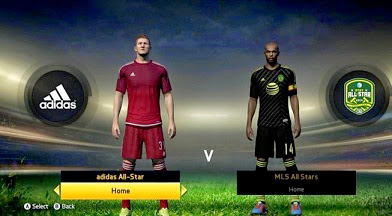 Check out how to unlock Adidas and MLS All-Stars teams. In the game's main menu, go to "Catalog" option. Note that you must be connected to the internet. In "Gameplay" tab, look for "2014 AT & T MLS All-Stars Team." Note that you must have reached at least level 14 to unlock the team. To unlock it, click A / X on it and select "Redeem Now". To unlock the team of superstars sponsored by Adidas, search for "adidas All-Star Team," also in the Gameplay tab. To open this team you must have reached to level 24. Repeat the same process and click "Redeem Now" to release the team. To use times, go to a quick game or online game against a friend. Teams can not be used in online competitive modes, or career. Both teams can be found in the league "Rest of the World" (Rest of World). MLS side, you will find a team of the best players from last season in the American Soccer League. Among the major superstars are Bradley, Yedlin, Dempsey and superstars Henry and Cahill. In the Adidas team level is even higher, with a lineup built by superstars sponsored by the German company. Some of the names are Bale, Suarez, Xavi, Neuer, Van Persie and Argentine Lionel Messi. The bench is also packed with stars.